My first introduction to Juvia's Place was an email sales notification from hautelook.com last year. To date, I own all of their eye shadow and blush palettes, and last august when the brand was offering 40% site wide, I added the liquid lipsticks to the mix. In all honesty, I had low exceptions with how these liquid lipsticks would perform. But, surprisingly, they're good. I also own 3 of Juvia's single liquid lipsticks. 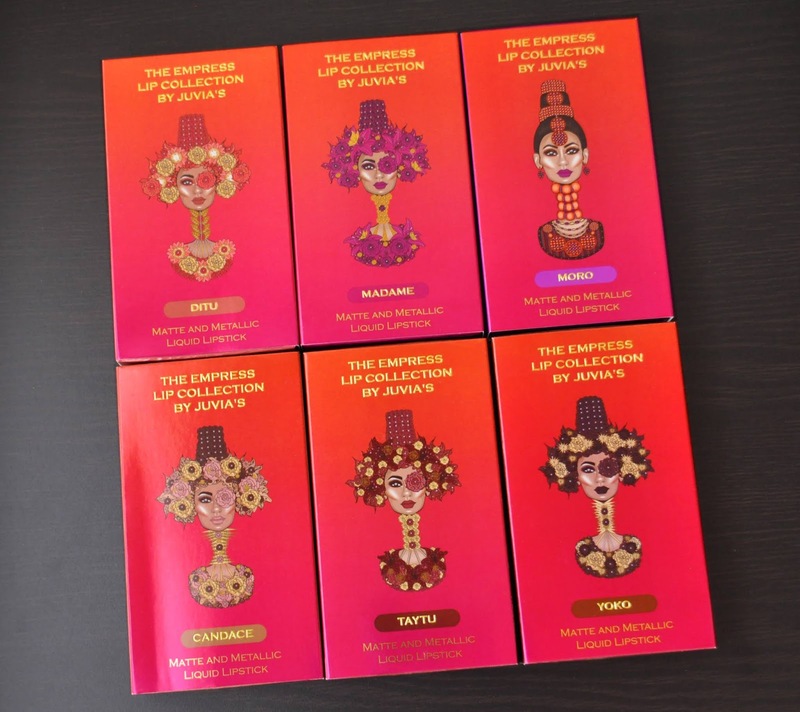 However, this post will focus on the Empress Liquid Lipstick Duo sets. The duos come with a matte, and metallic liquid lipstick, and both formulas have a buttercream scent. I've searched, and searched, and searched, but I can't find the photo of the applicator, but it's a doe-foot. From left to right: Candace, Ditu, Yoko. Candace: both, the matte and metallic, are a milk chocolate brown. Ditu: both, the matte and metallic, are a muted terracotta orange. Yoko: the matte is a dark, espresso brown. And the metallic is a deep, bronzed chocolate. From left to right: Taytu, Madame, Moro. Taytu: the matte is a dark brownish, cranberry-red. And the metallic is a deep, muted reddened plum. Madame: both, the matte and metallic, are a violet purple. 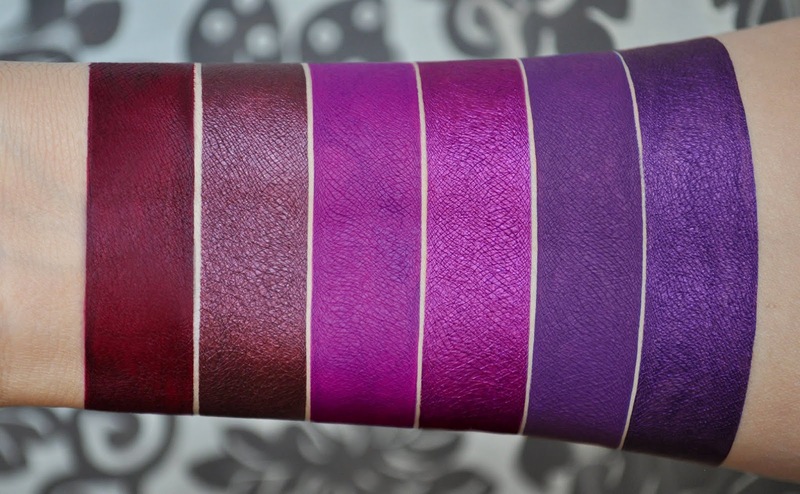 Moro: both, the matte and metallic, are a deep, royal purple. Of all the shades, Taytu needed two coats to correct its patchiness, and Moro was the only one that looked, and felt, the most drying. Overall, the formula is pigmented, comfortable on the lips, and as long as you don't eat anything too oily or complicated, they'll stay transfer-proof (but not smudge-proof) and wear well throughout the day. The Empress Liquid lipstick duos retail for $18.00. However, Juvia's Place usually offers some form of a discount on their website, so you may be able to get them at a lesser rate. 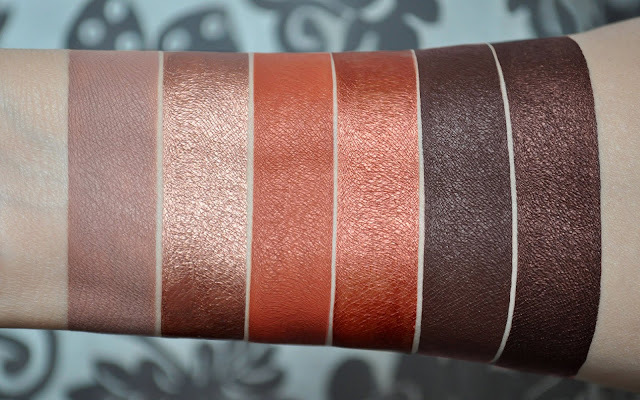 Your swatches are always the best!